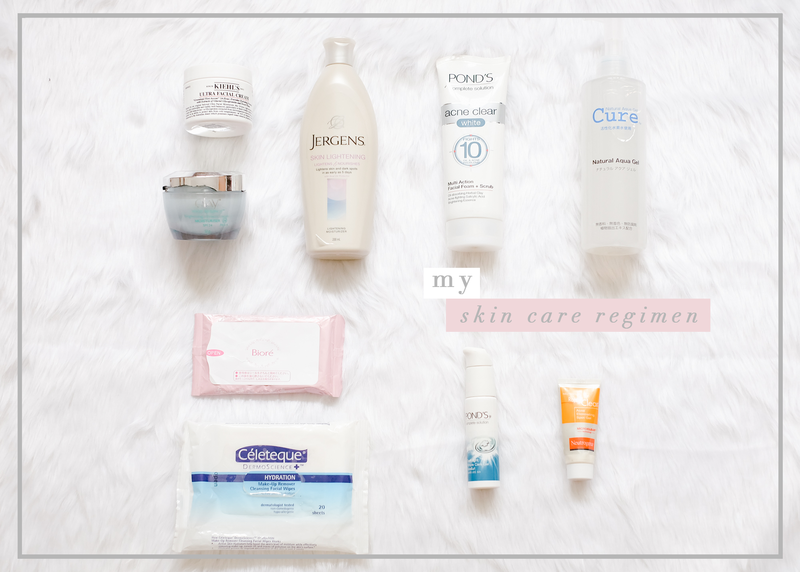 Finally sharing with you guys a highly requested blog topic – my latest skin care regimen! First of all, I’ve always believed that “less is more” when it comes to skin care. Why? The real reason is because I’m just super lazy to put a ton of products on my skin (I really don’t know how other girls do it??) It was only recently as I got older did I feel the need to put more product (#signsofaging, lol). Another reason is because I grew up not knowing much about my own skin, such as my skin type (i.e. dry, oily), making it harder for me to decide on what kind of skin care products to purchase. Often times, I would end up empty handed because I was just indecisive. Until now, I’m not exactly sure of my skin type (a mix of all or normal?). I’m sharing all of this just to support my disclaimer that I am no beauty guru and all the products I’m reviewing below are based on my personal experience. To add to that disclaimer, this is not a sponsored post and you will find a completely honest review and even a side-by-side comparison between similar products with different brands. Again, since I don’t buy a lot of skin care products most of these have been given to me (will be disclosed), while others were bought on my own. In any skincare product I use, my utmost priority is comfort. If I feel like I’m not wearing the product, the product is all the more the better! 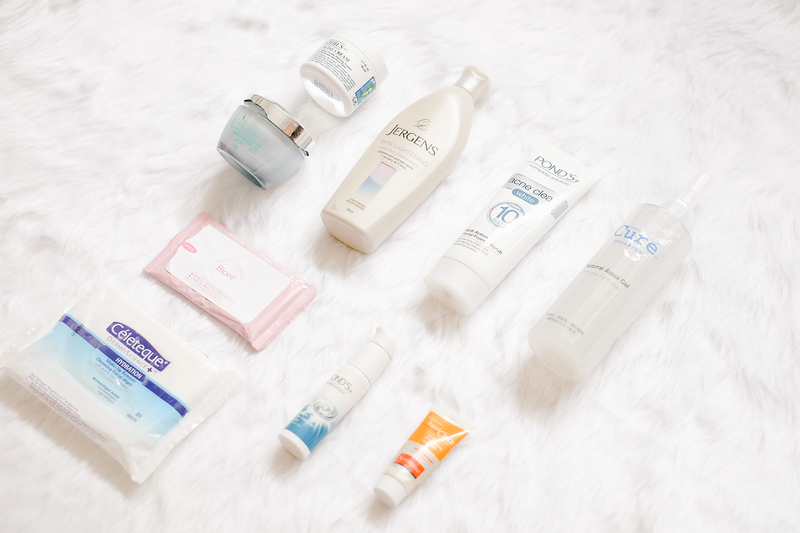 Below are the following 9 skin care products I use regularly. To know more about these products and their components, claims and ingredients, click the name of the product to be redirected to their respective official pages. If there is anything that stuck to me about proper skin care, it’s to make sure to “moisturize, moisturize, moisturize!” True enough, it has become a habit of mine and one thing I never forget to do! Currently, I am alternating between two creams. I first tried this product because it was included in a gift bag I won from a P&G (the company manufacturing it) seminar. It was a smaller travel version of the one in the photo and after finishing it, I got a bigger one for daily use. I’ve tried a couple of moisturizers before and I stuck to this because of 4 reasons: 1) it hardly has any scent (I don’t particularly like fragrant products on my face) 2) it has a whitening component, 3) it’s very light on the face despite its creamy texture and 4) it contains SPF 24+ so you don’t need to put sunblock on top of it (but I can put makeup over it!). Sometimes though it causes a peeling effect and I’m not exactly sure why… maybe it removes dead/dry skin? One thing I don’t like about this product is its filmsy packaging (as you can see on my photo). The lid of the product seems to crack and break off (without me doing anything! ), which is dangerous especially if it falls inside and mixes with the cream. Hope they can change or fix it! It happened to all three of my purchases! I only received this product recently and now it has become one of my favorites. It claims to have a “24-hr, everyday hydrating formula“, which is especially important if you are out and about the whole day. The formula is “made with Antarcticine, a Glycoprotein extracted from microorganisms microorganisms sourced from sea glaciers and notable for an ability to protect skin from cold air as well as Imperata Cylindrica, a plant indigenous to the Australian desert that possesses superb water retention properties in dry conditions.” So basically it’s made of exotic and NATURAL stuff that protects your skin most especially in harsh weather conditions. The number one thing I love about this product is it’s sheer and light texture. Compared to my Olay cream, the consistency is much lighter. The only thing missing about this product is SPF. When it comes to lotion, the first thing I make sure is that it is non-sticky and has a light texture, and this brand is exactly that. This is not the first variant I’ve tried; I was sent the “Original Beauty Lotion” before and continued using it for three reasons: 1) the scent is not overpowering, 2) it feels as if I’m not wearing lotion at all, and 3) it keeps my skin moisturized throughout the day. I switched to this variant recently after all the traveling I had this month, which gave me a major uneven tan! Hopefully it gets back to normal soon with the help of this. This has been my facial wash for about a year already and I have not switched to any other brand. It claims to target acne and I must say that ever since I tried it I haven’t had pimple breakouts as often. It also does not sting and smell (unlike others). The texture is creamy-like (not gel) and contains beads that are supposed to clean even your deep inner skin. Note: They recently updated the packaging and name of the product (see link), so I’m not sure if the formula is still the same, but I guess the benefits are similar. This is my FAVORITE product as of the moment. It’s known as “Japan’s No. 1 Exfoliator” and is apparently highly raved and reviewed by beauty bloggers worldwide. Don’t let the clear and simple packaging deceive you, this stuff is powerful and works like magic! You just have to spread and massage the body part(I believe it can be used for both face and body) you want for 30 sec to a minute and you’ll start feeling your dead skin (sort of like “libag”, lol) coming off. The texture is slightly clear and more liquid than gel so it makes me wonder how it can have that instant effect, without the beads usually found in exfoliating products. Another thing I like about this product is that it doesn’t sting or smell like alcohol! It’s highly addictive (who doesn’t want dead skin removed?) but is recommended to be used only 2x a week to keep skin healthy (I could honestly do it everyday). I don’t do facials so this is a great alternative (faster & cheaper!). Definitely recommending this! I got this product abroad when I had a major breakout. It’s an ointment that’s supposed to prevent pimples even before they fully manifest. So when I feel a slight bump on my face, I make sure to put some already. It does not work as fast though and doesn’t work if you put it too late. I’m pretty sure they don’t sell this in Manila — could you guys suggest other good acne gels/creams? This is what I use when #6 can’t do the trick. I haven’t used it so much because again, I haven’t had a lot of extreme breakouts lately but during the times I did, this product was effective in minimizing the acne by drying it up. Note: I’m not sure if they still sell this in the market, I think it has been replaced already with a product with similar benefits (see link). Another major skin care lesson is to “never sleep with make up”. Most of the time, I’m really lazy to remove make up especially after a long day so I found the easiest way to do it — wipes! Here are the two brands I use. I’ve been using this brand of make up wipes ever since I can remember. Compared to other make up wipes, its texture is smooth, the scent is not too strong (so it doesn’t sting so much) and has a moisturizing after effect. The only con is that it doesn’t completely and easily remove make up (especially in the eye area). Sometimes in the rare occasions that I wear heavy make up, I need at least two wipes to do the trick. I call this the “super make up remover” lol. If you need a make up remover that takes off any make up in one go, this is it. This item was sent to me and now I make sure to not use it so often because I’m scared it might run out! Haha! It’s super effective in taking out anything – especially eyeliner and mascara. The only thing that bothers me is its strong alcohol-like smell making it sting a bit – but I think that’s what makes it effective. 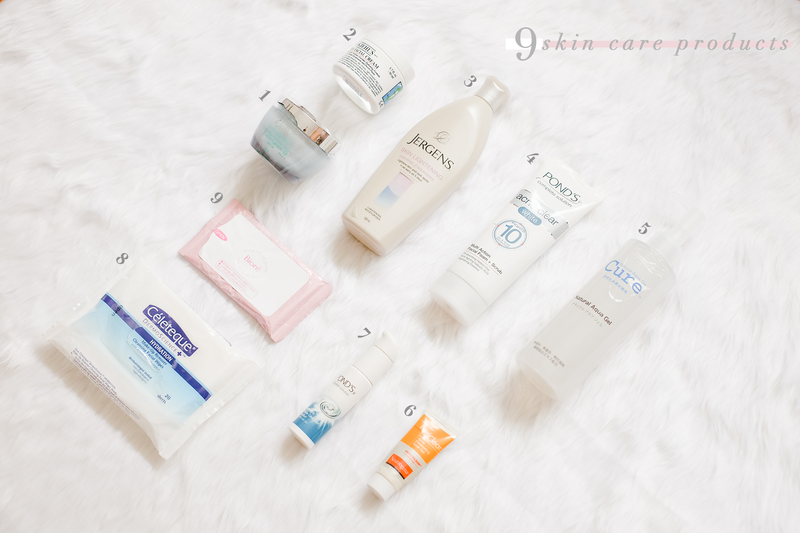 So there you have it, my 9 skin care products! I’m pretty sure this will still change as I continue to try more products. I can’t say that these are perfect for everyone since we all have different skin types and preferences. If you have further questions, feel free to leave me a comment! If you also have other products to recommend, please do to help a skin care noob like me out! Lol. Human Heart Nature has a really good Acne gel 🙂 Best part is it’s all natural! Thanks for sharing this with us! We recommend you try these skin ingredients too! Healthier skin is coming your way http://www.skinmatters.com.ph/mskinmatters/index.php?p=skin-care-article&id=538!